The move coincides with other steps the organisation is taking to prepare for a number of emergency scenarios, including the possibility of war. On February 25th, Magen David Adom, dedicated its new National Operations Center in Kiryat Ono, a new dispatch center that’s housed in a reinforced and partially subterranean facility designed to be protected against missile, chemical, and biological attack. The new center has been fully operational since the start of February. 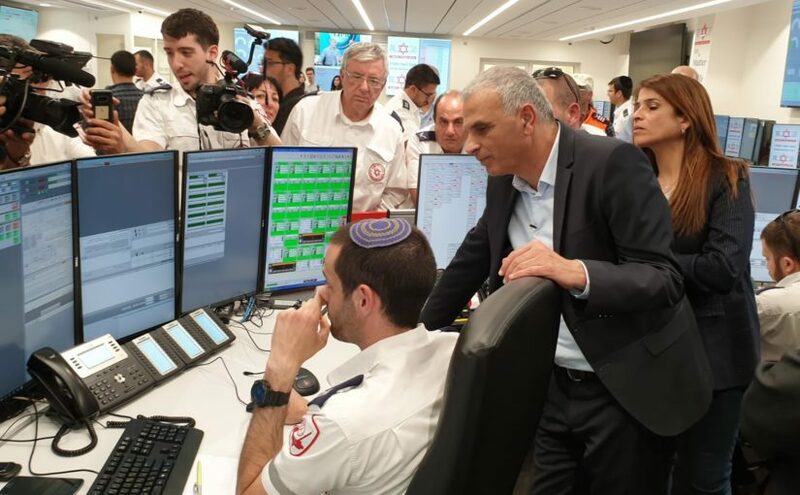 The regional dispatch centers for the Yarkon and Ayalon regions, two of the nine regional dispatch centers MDA also operates, are also now working out of the protected facility in Kiryat Ono. The dedication was attended by more than 200 people, including Israeli Finance Minister Moshe Kahlon. The move to a protected dispatch facility is one of several initiatives Magen David Adom has undertaken in recent years to reduce the disruptions Israel’s emergency medical services would have to contend with in the event of a war. MDA is also currently constructing a new reinforced blood services center in Ramla, which like the new National Operations Center, is designed to be protected against attacks. That facility will be completed in late 2020. The new National Operations Center is just one floor below MDA’s previous dispatch center, making the transition as seamless as possible. The lower floor underwent extensive renovations to be reinforced and fitted with a state-of-the-art air-filtration system to guard against a number of different kinds of attacks. “Our goal was to harden our facility and ensure we could continue operating in a war without causing any disruption to our day-to-day EMS operations during the transition,” said Ido Rosenblat, MDA’s chief information officer. As an additional failsafe measure, MDA’s regional dispatch centers can handle the National Operations Center’s dispatch load should it be disabled. In addition, a state-of-the-art mobile command center can also take over much of the dispatch operations. As Israel’s national EMS dispatchers, Magen David Adom deploys 1,100 of its own ambulances, 25,000 MDA EMTs as well as more than 8,500 first responders, most based on motorcycles.